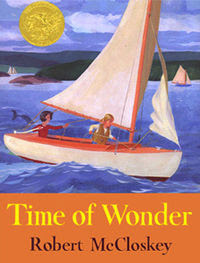 How could I begin my Liz’s Summer Picks with any other book than Robert McCloskey’s Time of Wonder? Winner of The Caldecott Medal as “The most distinguished picture book of 1958,” it’s a classic picture book, if the word classic still has meaning in this genre. His observations of one matchless summer season in the islands in and around Penobscot Bay in Maine are evocative, beautifully illustrated and reflective as the moods of the seasons and the sea he describes through the eyes of two children. to minute, hour to hour, from day to day, season to season. Whether diving off rocks on the island’s point made by glaciers eons ago into icy cold water, sailing among the islands where mother seals nurse their babies in Swain’s Cove Ledges, watching porpoises at sunset “puffing and playing around your boat”, days build with a lazy momentum. It captures the pulse, pace and promise of life lived by this family of four that is unhurried enough to savor the moments. But these small moments of discovery build to a sense and signal that the winds inevitably change to something quite eventful. Nature can change in a moment with a sudden ferocity coming ashore, blowing the cozy cabin door open sending people, Parcheesi boards and papers flying. There is gentleness to McCloskey’s book that gives the eye and ear time to sense and explore with the children the feeling of this island respite in Maine. And there is a sweet sadness at its close as another summer ends and school beckons with the quickening pace of life off island. The time you and your children will spend there is time lived fully and intimately with nature and the natural pace she sets. It is a time of wonder you will long remember and savor with your child again and again.